The first factor you need to decide when having a brand new sports facility constructed is the size and dimensions you wish your facility to be. The easiest way to calculate what size and dimension it needs to be is through figuring out what sports you’ll be using the facility for. With a polymeric surface, dimensions will be suited towards sports such as tennis, netball and basketball, which don’t necessarily require a huge surface area, allowing for a better allocation of space. You can have specially designed line markings that can be painted on top of each other in contrasting colours to create a variety of sports pitches on just one facility – helping save space and give you a better idea for polymeric surface dimensions. Get in touch with our team to discuss all of the options and to find out more about prices for installing these facilities. Polymeric courts size will also vary on whether the surface is being used for professional or competitive usage. As certain sport pitches need to fit within a certain size to fulfil the criteria set by certain sporting government bodies. For polymeric courts size, if the surface is being used for tennis at a professional competitive level the dimensions must fit within the specifications set by the ITF. 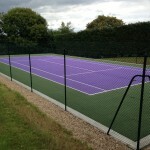 The polymeric courts size can also vary depending on budget, if the institution does not have a lot of disposable money, and their budget is tight, they can have smaller courts and pitches installed as they do not need to fit within any specific criteria, this allows for savings that can be reinvested into the surface to make sure that it is properly cleaned and maintained to ensure the safety of the children/athletes using it.